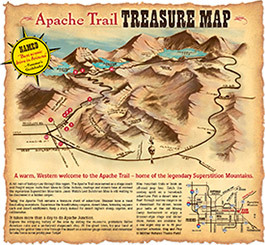 Starting at Goldfield Ghost Town, the 2 hour “Quarter Trail Tour” will snake you along the historic road where some of the best scenery in central Arizona can be seen. Steeply rising to the north is the Four Peaks Wilderness and to the south the Superstition Mountain Range. The steep-sided canyons, rock outcroppings and magnificent geologic formations are especially beautiful in spring and fall. Heading down the Apache Trail, you’ll come to the shores of Canyon Lake which twists for 10 miles through a magnificent gorge. It is one of four lakes formed by damming the Salt River, the course of which runs right through Phoenix. Just imagine the difficulties encountered constructing this road to Roosevelt Dam back in the 1930’s! Stretch your legs on a nature walk at the overlook of the famous Fish Creek Canyon. No matter the season, the sheer canyon walls offer a palette of nature’s colors. On your return to Goldfield Ghost Town, the scenery takes on a whole new perspective. Excitement awaits on Highway 88 – join us today on this breathtaking tour! If fewer than 4 in your group, call the office for available seating with other guests. Prices Do Not Include Tax & GratuityBook online! The 4 hour “Half Trail Tour”, winds through the majestic canyon area of the infamous Apache Trail – home to bighorn sheep, javelina, deer, mountain lion, and eagles. A camera is a must! 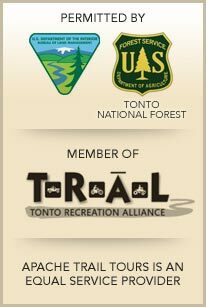 Your journey will meander through a scenic masterpiece as your guide weaves the tales of the Trail. Your journey may include stops at Weaver’s Needle Lookout and Canyon Lake Overlook. After cresting the top of Fish Creek Hill, the journey continues down the road that hangs on the side of this high-walled canyon and winds its way along tremendous precipices that sink sheer for hundreds of feet below. Next the path will lead to the Reavis Ranch Trailhead with a view of Apache Lake. On the way back to Goldfield Ghost Town, we will stop at Tortilla Flat. This old stagecoach stop built in 1904 was the first of only two stops between Phoenix and Roosevelt Dam. Take a walk along the boardwalk and try a scoop of the town’s famous prickly pear cactus ice cream. Sit back, enjoy and leave the driving to us! Prices Do Not Include Tax & Gratuity. Call our office at 480-982-7661 to reserve this tour. 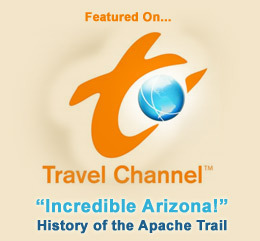 Best of Apache Junction Award goes to Apache Trail Tours 3 years running.